Ricers are not an essential piece of kitchen equipment but are handy nonetheless. They are so-called because the holes in the utensil are similar in size to grains of rice. Ingredients are pressed through these holes to make them finer and easier to process. Mashed potato is a classic accompaniment to many dishes such as stews, pies and roasts. It seems like a simple enough dish, but we all have faced the disappointment of a pile of lumpy, inedible, flavourless mash. 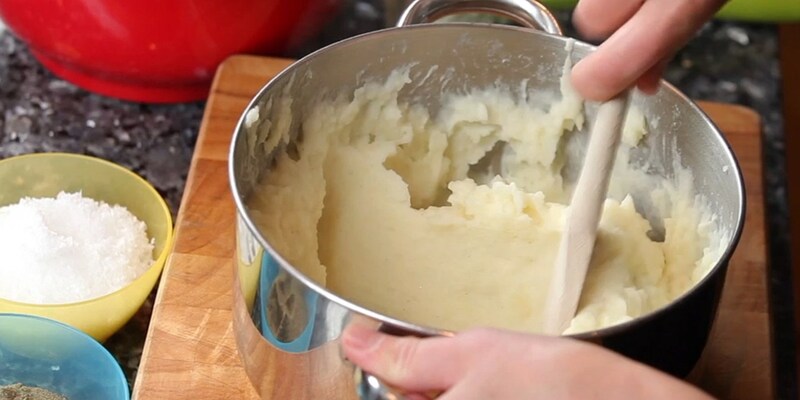 By using a potato ricer, you need never worry about lumps again - this handy kitchen gadget gives consistently fluffy mash every time. Ricers can also be used to make purées from other cooked vegetables and fruits such as apple purée, and can be used to press roasted tomatoes to separate tomato skins from pulp. The German dish of Spaetzle can also be made using a ricer. A ricer is commonly made out of stainless steel, which makes it easy to clean as well as being sturdy. Larger ricers can also be found and will process a greater amount at one time. Non-slip grips on the handle can help to maintain a sturdy grip when ricing. This method is for ricing potatoes, other ingredients can be riced using a similar method.